An IFJ report says online surveillance increased, and Web sites were "entirely or partially closed." (CNN) -- "Media must cease reporting on the discovery of a body at a psychiatric hospital in Dongguan." "Media must not report on corruption allegations relating to the eldest son of President Hu Jintao." "Media must not report on a lawsuit against China Eastern Airlines by victims of a plane crash in 2004 in which 52 passengers were killed." Those are just a few of more than 60 restrictions the Chinese government slapped on the media in 2009, often secretly, according to the International Federation of Journalists. The press freedom group said it obtained written media-related orders which are published in its report, "China Clings to Control: Press Freedoms in 2009." Tight controls were put on reporting of ethnic riots in the west of the country in July, and clear orders were issued for how to report President Barack Obama's visit to the country in November, the IFJ said in the report released Sunday. The press was instructed not to organize questions for the public to ask Obama at a town-hall style event he did in the country and was banned from reporting on "protests or spontaneous news during Obama's visit," the IFJ report said. It all added up to a year of increased censorship in China, on the heels of a period of relative openness around the Beijing Olympics in 2008, the group charged. CNN's calls to the Chinese Foreign Ministry and the Chinese Embassy in Washington were not immediately returned. The IFJ report said that Chinese media were ordered not to report prominently on protests in Iran following the country's controversial presidential election in June. They were barred from reporting at all on elections for the chief executive of Macau, a region of China, and were waved off stories about refugees entering China, threats to public health, political protests and corruption, the report said. They were allowed to report about some stories in English but not Mandarin, and others in newspapers but not online, said the report, which was compiled with the help of a group called Chinese Human Rights Defenders. That's not to mention self-censorship in the press around two key anniversaries last year: the Tiananmen Square pro-democracy protests and the Tibetan uprising of 1959, the IFJ said. "Media did not need to be ordered how to report these matters -- they were very aware there was to be no independent reporting on these topics," the report said. "Most journalists and media outlets would self-censor and there would be no need for regulations or orders... self-censorship remains a matter of self-preservation." Direct orders from the government -- sometimes containing the explicit threat of "punishment from the Central Propaganda Department" -- was only one element in Beijing's arsenal against the press, the report said. 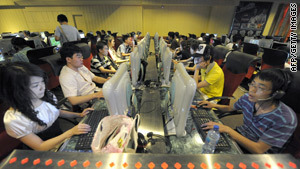 China is clearly concerned about the Internet, the IFJ suggested. "Online surveillance was stepped up, Web sites were entirely or partially closed, online social networks were shut down, online news portals were censored, online journalists and bloggers were detained and arrested." Press "accreditation rules tightened further in 2009... making it difficult for online journalists to gain accreditation," the report said. And foreign journalists encountered "acts of violence, destruction of work materials and equipment... surveillance and reprimands," the report said. But "despite the difficulties, many journalists try to go out of the way to get the news," the IFJ said. China hosted a World Media Summit in October, drawing the heads of some of the world's largest news organizations, including the Associated Press, Reuters, News Corporation, Russia's Itar-Tass, Kyodo of Japan and China's own Xinhua. President Hu addressed the conference, saying "it is more important than ever before that the media should establish and uphold social responsibilities," according to Xinhua. Hu pledged the Chinese government would safeguard the legitimate rights and interests of foreign news media and continue to facilitate foreign media coverage of China in accordance with the law, Xinhua reported. It is not clear that he made a similar promise regarding Chinese media. Obama criticized censorship in his November visit to China, responding to questions from the Chinese public about restrictions on the Internet. "Because in the United States information is free, and I have a lot of critics in the United States who can say all kinds of things about me, I actually think that that makes our democracy stronger and it makes me a better leader because it forces me to hear opinions that I don't want to hear," he said. Earlier this month, Secretary of State Hillary Clinton called on China to investigate alleged hacking of Google in the country -- prompting the Internet search giant to threaten to pull out of China. "We look to the Chinese authorities to conduct a thorough review of the cyber intrusions that led Google to make its announcement. And we also look for that investigation and its results to be transparent," Clinton said. Five years ago, Google agreed to allow some censorship by China, in exchange for the right to operate in that country's massive emerging technology market. The company now says censorship and the hacking of Chinese dissidents' Google e-mail accounts have prompted it to reconsider. The IFJ calls itself "a non-governmental, non-profit organization that promotes coordinated international action to defend press freedom and social justice through the development of strong, free and independent trade unions of journalists." Is it 'High Noon' for Google, China?